Low rates and weekly discounts! With a view from each and every room, spread over three levels, this holiday home offers a private and peaceful retreat, and so close to town. A Huge wood burner to keep you toasty this winter with everything to get it going supplied. And if you have a late check in we are happy to get the fire going for you. The home has three bedrooms,, tiled bathrooms and spacious living with multiple decks and amazing in/outdoor flow. Appreciate relaxed living in this superb spot that offers year-round sun and amazing views from the sheltered bay together with vistas through the trees enjoying an array of birdlife. The kitchen/dining/living space has a wood burner, rich timber floors and restful ambience. Throw open all the doors in summer and feel secure and cosy in winter. Tv has Apple Tv with Netflix, ITunes etc.. The downstairs bedroom has an ensuite with it’s own deck and Freeview TV. Upstairs is a King room with Ensuite and balcony, and a Twin Room. 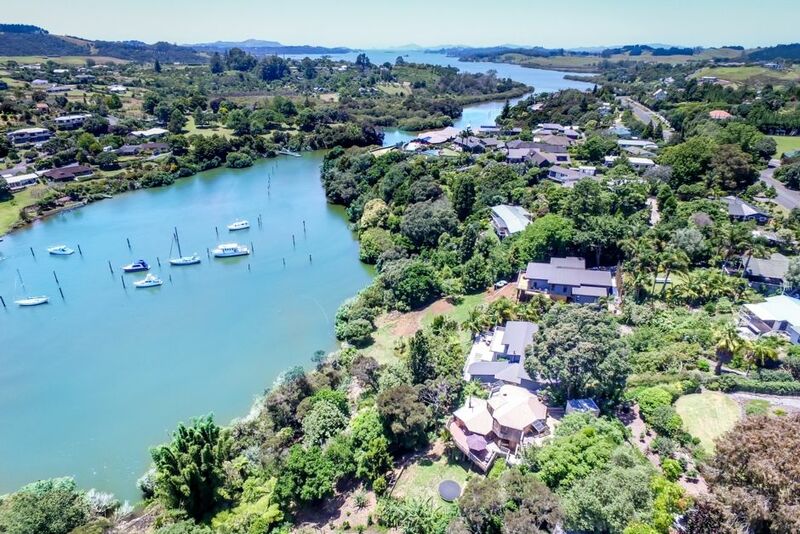 Look forward to fun-filled summer holidays and cosy winters in this sheltered, north-facing bay in the sought after Riverview area. This property is not suitable for parties. Small children are to be supervised at all times due to heights and water. House has stairs so suitable for able guests only. A landscaper / gardener is at the property from time to time, please let me know at the time of booking if this is a problem for you. Up to 2 off Street parking. Very quiet, private, with no road noise. Very quiet, private, with no road noise. Quite a tight space but comfortable. Nice view with sounds of a waterfall at a distance.